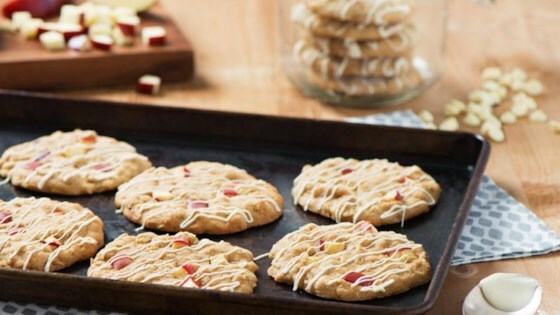 "The warm goodness of oatmeal and brown sugar pair with apple and cinnamon in this spicy, soft & chewy cookie." Preheat oven to 375 degrees F (190 degrees C). Combine flour, baking soda and salt in medium bowl; set aside. Beat Becel Buttery Taste margarine with sugars in large bowl. Beat in eggs and vanilla until blended. Gradually add in flour mixture; beat just until blended. Stir in oats, apples and cinnamon. Drop by tablespoonfuls onto ungreased baking sheets, 2-inches (5 cm) apart. Bake 8 minutes or until edges are golden. Cool 2 minutes on wire rack; remove cookies from sheets and cool completely. Microwave chocolate in small microwave-safe bowl until melted. Drizzle cookies with chocolate.